Cultus Lake is only a 20 minute drive from the TransCanada Hwy at Chilliwack. A small village hosts a good waterslide park, a public wharf complex designed into a great swimming area, ice cream stands, a putting golf course and other tourist activities. If Cultus’ weather does get wet, then that 20 minute drive finds Chilliwack’s shopping malls, indoor municipal pools, movie theaters or restaurants.Just the other side of the village is Sunnyside, a popular private campground that we have never stayed at so would appreciate reader comments for this blog. 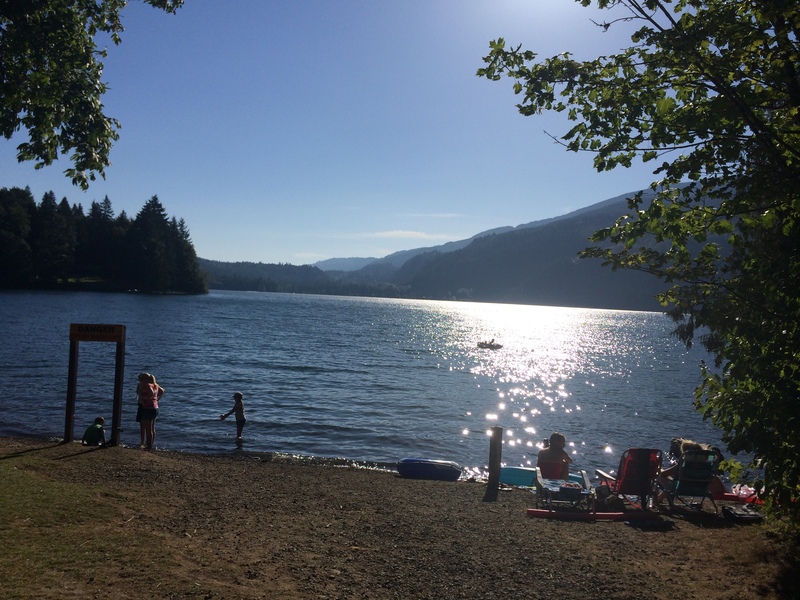 Slightly further down the road is Cultus Lake Provincial Park which contains 4 regular campgrounds, and 4 group campsites, plus some day use beach areas. We’ve camped there numerous times over the years, with July 2014 being the most recent. Our most recent visit we noticed that you can now rent sites with the trailer set up. I have not idea what this cost but they seemed to get the choice sites. All of the campgrounds fill up quickly for the summer months so book early. Be prepared for some loud neighbors as some people do like to party at Cultus. I’ve noticed things are quieter nowadays but that could be because of management or maybe because we are getting older. Each campground is tied by the main road that continues to the south side of the lake where various private cottages exist. The road also serves logging trucks so my main advice is to choose a campsite as far off the main road as possible. Those trucks run day and night. We’ve probably stayed at all 4 of the main camp grounds over the years. All are typically nice provincial campsites with no hook-ups but trees & bushes between sites that make BC’s provincial parks so enjoyable to camp. All toilets are flush and there are showers. Recommended sites: When choosing a campground, Delta Grove and Maple Bay are both on the lake side of the highway while Entrance Bay and Clear Creek require you to cross the highway to get to the beach. One of the group campsites is on its own jetty of land, so looks like it will keep your crowd together and separated from other campers. We have not had the chance to stay at any of the 4 group sites. For any of the 8 campsites, try to avoid sites that back onto the highway. There really is non stop traffic and it is very noisy. In Delta Grove try to get double site 39 A&B, and single sites anywhere from 13 to 38 with the lower numbered sites having more trees. All the lake front sites are quite small so an RV and a tent is a bit of a challenge. Lakefront site 15, 16, 17 & 19 are quite slopped so keep that in mind. Sites 18, 20, 22 & 24 all have the fire pit and picnic table fully exposed to the road so very little privacy. The washrooms have not been given a good cleaning in a long while and it appears this is not a priority for this management company. Traffic noise from the highway. For a quieter get-away, choose Chilliwack Lake Provincial Park camping, which is less than an hour away. 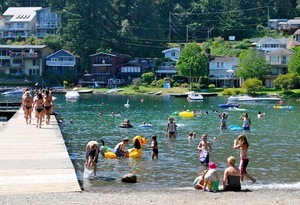 Maple Bay has sites that are a long way from the beach.